In this life-changing post, you’ll learn how to get access to the secret techniques for getting your dream job in the highly competitive Nigerian labour market — as revealed by seasoned Nigerian HR professionals and hiring managers. About 6 or 7 years ago, when you tried to picture where you’ll be by this year, what did you see? You saw yourself working with a reputable company and earning a fat salary, right? And riding a nice car, and living very fine, right? Hmm… But now, reality doesn’t seem to agree with those dreams. You still haven’t gotten the job you want­—even after you might have submitted more-than-countable job applications and attended several job interviews. You’re still unable to implement those big plans have for your life. And you’re still not financially capable to play “big brother/sister” to your younger siblings and relatives. Your parents haven’t really started enjoying the fruits of their hard labour, and yet, you probably still fall back on them for some financial assistance. In fact, your dream job seems to exist only in your dreams. And your hopes of getting that dream job die with each passing day—no thanks to the ever-increasing number of graduates and the ever-reducing number of available jobs. NOT having a good job makes you feel bad. It makes you feel like you have no power or control over your life. It creates a feeling of low self-esteem that slows down every other aspect of your life. And it leads you to feeling like a FAILURE as an ADULT. If I may ask, do you know why you’ve not gotten a good job yet? But do you know why all these reasons are pure lies? Most of them had no connections. Many of them had CGPAs that were way below yours. And many of them studied courses that you’d think are not relevant to the jobs they got. Yet, they got the lucrative jobs you’ve been craving. My friend, it’s not always about connections, or your CGPA, or the course you studied. It’s about doing things the right way. The reason you’ve not gotten your dream job yet is, you’re not doing some things right. And as a result, you’re losing your chances to those who are doing those things right. Period! You won’t get the high-paying job you always wanted if you’re looking for it using the traditional approach adopted by 99% of people…especially with the HUGE competition out there. This approach will only drain your energy and get you more and more frustrated. And even if this faulty approach works, it doesn’t work for high-paying jobs. I doubt whether it even works for getting ordinary jobs anymore. Your application letter is poor, boring, and unprofessional. If you really know how to get all these things right, you’ll get the job of your dreams, and you’ll start living the kind of life you always wanted. But you won’t get this knowledge by osmosis. You have to learn it. I have put together an entire, one-of-a-kind ebook titled “How to Get Your Dream Job in Nigeria”… and it’s going to turn your world around in ways you can hardly imagine. …But it will also completely IMPLANT the skills you need to get your dream job into your mind, brain, and personality… and make them a PERMANENT part of you. How to craft an attention-grabbing CV that stands out from the crowd and gets you an interview invitation. How and where to find lucrative job opportunities that others may not even know about (you won’t find many of them in newspapers). How to identify job vacancy scams that are out to waste your time, raise your hopes, and steal your money. How to tailor your CV to suit any job position so that it beats other CVs hands-down. How to write a powerful application letter that fascinates the employer and makes them develop instant interest in you. How to properly send an application via email. How to get a job even when you’re not fully qualified for it (no connections needed). How to easily pass a job aptitude test. Mistakes you must avoid when applying for a job. How to prepare adequately for a job interview. Tips for dazzling at a job interview­—and getting the job eventually. 15 interview questions you can’t escape, and how to answer them brilliantly. And lots more on how you can impress hiring managers with your application and compel them to hire you­—with practical examples to guide you. And two others whose names are better not published for professional reasons. Order your copy of How to Get Your Dream Job in Nigeria, and you’ll get the 92-page, no-fluff, easy-to-read, eye-opening, and interesting ebook in PDF format (so, you can read on your PC, tablet, or smartphone). Please note that the book is ONLY available in the electronic (PDF) version. So, no hard copies for now. 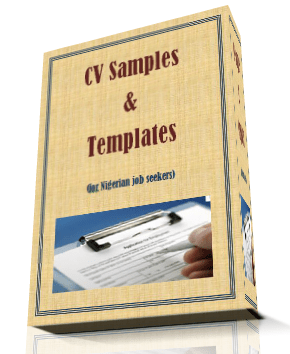 This is a collection of CV templates and samples that you can use as guide when writing your own CV. This is a collection of job aptitude test questions and answers on verbal reasoning, numerical tests, mathematics, and abstract reasoning. 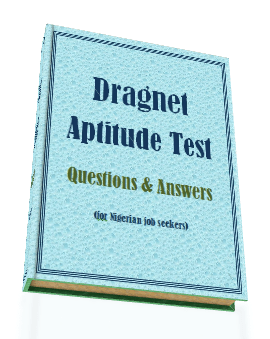 The pack will help you prepare adequately for aptitude tests, as it contains over 200 practice questions. Now, I want to help you get this part of your life handled so that you would permanently bring joy and prosperity into your life, and I don’t want ANYTHING to stand in your way… including your present financial situation. The two bonuses are worth more than N1,000 each. You can do the calculation for yourself, and you’d see that I’ve been very fair with the pricing. So, N1,500 is not too much at all. You’ll be paying just N1,500 for this ebook and the added bonuses. Once I confirm payment, I’ll send you an email containing the ebook and the accompanying bonuses within 12 hours. This is your opportunity to learn how to beat others to those lucrative jobs. Grab it now­—with both hands. As a respected Nigerian career blogger, I receive emails from time to time from people on job and career matters. When I received an email from one Abass Toriola couple of months back, hinting me on a book he was writing on getting jobs in Nigeria, I must confess I dismissed it as just another book to be added to the thousands that existed on the subject. Not even his excellent use of English that immediately caught my attention in the long email made me give him benefit of doubt. Fast-forward to two months later and Abass got back to me with a copy of the book. Flipping through the pages, I was dazed. It is an excellent work. It was different from the run-of-the-mill materials that litter the blogosphere on the subject. My problem with many materials on jobs in Nigeria is inability of the authors to localize the content. Rather, what we have are outright regurgitation of foreign system. I set out to pick this hole in Abass’ work as a critic, but it was an exercise in futility. He did his homework well. The book is rich in local examples. He buttresses his points with practical examples, a breakaway from theories that dominate many such efforts in the past. He fully demonstrated knowledge of Nigerian job markets, which he must have gotten through thorough research. He also spoke with top recruiters of labour. In fact, it was in the course of reaching out to top Nigerian career consultants that he got in touch with me. I never knew him before. HOW TO GET YOUR DREAM JOB IN NIGERIA is indeed a material I will recommend to students, job seekers and even those with jobs already. Hundreds of jobs openings spring up in Nigeria daily, yet many job seekers can’t get them because they’re unemployable. If you’re one of such persons or you hate to join them soon, “How To Get Your Dream Job in Nigeria” by Toriola Abass, is the hands-on guide you need. It will tell you in exact terms, what to do and what to shun, to stand out from the crowd. If, for any reason, you’re not satisfied with the ebook after reading it, or you think you’ve gained nothing from it, contact me for a full refund of your money. Yes, I’ll send your money back to your account. No hard feelings. I’m only taking this risk because I’m confident that this ebook will help you. If you have any questions concerning this ebook or your purchase, you can send an email to: basicfreelance@gmail.com, and I’ll be happy to respond. Better yet, call me on 0806 235 7604. This book isn’t for every job seeker; it’s for ONLY those who really want to get a good job and start living fine. It’s for ONLY those who prefer a blissful future over sitting idle and wasting years of their life. If you think you’re one of them, get your copy ASAP! There’s no better time than RIGHT NOW to start improving your life with a fulfilling and well-paying job, and this is the most powerful ebook available to help you do it. So, follow the instructions above and buy your copy now. P.S. The techniques taught in this ebook are not available anywhere else, as they were leaked by seasoned interviewers and recruiters. By buying this ebook right now and starting to follow the steps outlined in it, you’ll IMMEDIATELY start seeing better results with subsequent job applications. You’ll start getting calls for interviews and you’ll start acing interviews and landing job offers. So, buy your copy now. P.P.S. If you do not buy this ebook now, nothing will change. You will most likely continue to apply for jobs using erroneous techniques, and you will most likely continue to get the same results–disappointments! But if you want to get a fulfilling high-paying job that allows you to live the lifestyle of your dreams, buy this ebook now. Please save this page for future referencing (or better yet, write down all the details you will need later). This is necessary because you may later be unable find the link (or ad) that redirected you here. Good job there, Mr Abass. Your ebook will soon hit a record ‘one million copies sold’ in the shortest possible time. Congratulations! As an addendum, may I add that job seekers should also think beyond paid jobs and consider becoming entrepreneurs. Our program helps everyone, including job seekers, find a bearing. Many jobless people are today bread winners courtesy of this program. Hi Abass, I would love to partner with you and sell this books to my audience as an affiliate marketer. Hi Abass, you didn’t say one should state the e-book he or she paid for cos you sell several e-books. So if i make a payment into your account for an e-book for an e-book, how will you know the e-book i paid for? I’m glad to have come across this e-book on time. Please, does it contain in simplified details how to craft a CV for any job/ descipline graduated from? imiano ooo I see you!!! Thanks for your hard work, the book sounds really promising. I want to ask, how relevant is the book today and is it still 1,500 naira. Also, pls can you share testimonies of people that have used the book and got their dream job using the book. Simply follow the payment instructions on the page. Hi Abass, your style is awesome, I will love to meet you. I’m convinced your ideas will immensely help my blog born2succeed.org. Hi Abass,thank for your information about your on,how to get your dream job,here in Nigerian. i will like to get the ebook.very soon. Going by the dates on the comments, this book has been out since 2014, can i still get it? Mr abass? a phone number is better trusted than an email id. please put your personal phone number online for a better communication. I am interested in your ebook but I am afraid because you will not be easily reached through email id. be fast about the resolution. can I get the book immediately if I pay? What a post!… I’m already inspired by this post and I must do myself a favour by getting my own copies. Great job, welldone Mr. Abass! Thanks immensely, this is a real aid for securing my desired job. thanks for the wonderful information…bless you. Mr Abbas, thank you for this write up.I’ve been searching for something this rich for a while. Are there any updates this 2016 and is the price still the same? Abass how can one get acess to this ebook without undergoing all these process? ok so am reading wonderful comments on the book. Welldone Mr Abass. But how many jobs has it fetched your numerous readers so far? Has the techniques helped anyone in securing their dream job? am not a sceptic but I would like to see and hear real results. I love to read and even if I dont get my dream job after applying the techniques, I wont be asking for my money back but am sure there is a guarantee that it would help. Mr abass I really appreciate you for your job well done. I hope for this reasoning ability of yours,will save many nigeria graduate to secure well paid job in labor market. Please how can I have my own copy????????? You will definitely receive the book as long as you make payments. I am the author of the ebook. I’m not selling it on someone else’s behalf, and it’s not a physical book. It takes me less than 10 minutes to send the ebook to your email. So, that’s not something you should worry about. I’ve sold several copies of the ebook in the past. All you have to do is make your payment. Once I confirm it, you will get it delivered to your inbox within a few hours. If you’re so skeptical about buying the ebook, then there’s nothing I can do to change that because you’ve made up your mind. I don’t want to come across as being desperate. Howdy Boss, I need the book; is it in existence yet? The book is in existence, details on how to get the e-book is in the post. Great author, great books. I’ll look forward to get them. Thanks. Pls do u have something to offer me concerning forex trading bcos ,i can see the sign of truth in your words? How do I know that I have paid for the book through my master card? Or should I make alternate payment? How can I got the ebook? NICE WRITE UP, I’LL GET MY SOON. Yes Agnes, you can print it out as a hard copy when you get it. Does the book apply to third class graduates too? Hi Maureen, the book is for anyone looking for a good job regardless of their CGPA. It gives you valuable tips on what you need to do to land that dream job. You can find my email on the contact page. Is it only graduate the books is main for? It’s N1,500 for all three e-books. So Mr. Abass owns this site. More grease sir. Of course, your name will be displayed in the SMS credit notification. So, that’s no problem at all. The ebook does not describe where graduates of each course can work. It only explains how to quickly get any job your apply for. Piracy issues and delivery hassles. whats the guarantee that after paying d money, i’ll receive the ebook? There’s no reason why you shouldn’t get your ebook after paying the money. Many copies of the same ebook have been sold on this site and via other sites. Similarly, the ebook has been advertised and sold on Nairaland.com, the most popular online forum for Nigerians. FYI, ebooks and other products go through a thorough scrutiny before they are approved for advertisement on Nairaland. I think you should be convinced now that the ebook isn’t a scam afterall. Besides, I have my name to protect as one of Nigeria’s foremost online marketing strategists (see WebIncomePlus.com and ContentMarketingPlus.com — I own both in addition to this very website). similar books only concentrates on commercial and art bt not on engineering study. he abt ur book? How can i write for your blogsite? Thanks for your interest. Send me a mail (basicfreelance at gmail dot come) stating your area of interest. Bear in mind that writing for this blog is a volunteer task — it attracts no pay for now. Mr abass please can I get this book in any of our bookshops????? when one makes payment through online transfer, how do you identify the person as there will be no deposit slip number? I will get an instant notification from my bank. So, that makes me aware of the transfer. Even if there’s no deposit slip number, I can identify the person with other details. Abass nice write up. I will buy mine very soon! Please is this site a blog? If yes, was it created with wordpress or what? Yes, this site is a WordPress blog. So after paying and sending all the details of payment as outlined here, how do I get the book . that wasn’t specified. thank you. It’s clearly stated on the page. After confirming your payment, I will send the ebook and accompanying bonuses to your email. The ebook is in pdf format. please sir, how do I get my?